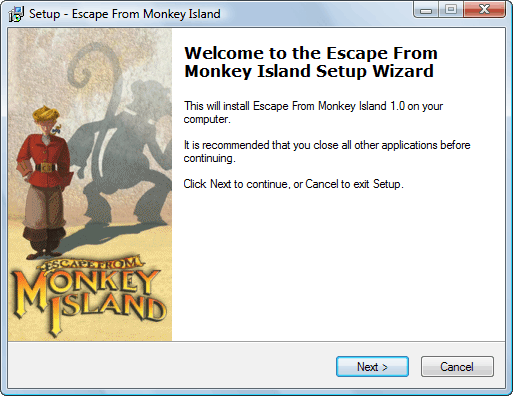 A replacement installer (setup program) for Escape From Monkey Island. The installer that comes with the game can be problematic with newer versions of Windows and refuses to work at all on 64 bit Windows. This installer works on both 32 bit and 64 bit versions of Windows and has been tested on Windows XP, Vista, Windows 7 and Windows 8. It should work fine with all Windows versions though. It performs a full install of the game and comes with my Escape From Monkey Island Launcher – which adds extra features beyond those in the game’s original launcher.